What Was Wrong With Peyton Manning? Everyone who watched the Broncos lose to the Colts yesterday could see that something wasn't right with Peyton Manning. He spent the first half air-mailing wobbly deep balls and the second half firing short, non-lethal passes while generally looking like an overmatched old guy. So what the hell was wrong with him? What Do The Broncos Do Now? ESPN's Adam Schefter is reporting that Manning played yesterday's game, and a good chunk of the latter part of the season, with a torn quad. Some inside the organization wonder. I talked to some Broncos players who said Manning was throwing more picks in practice in the past six weeks than at any other time. Before the game, some Colts veterans expressed to Broncos players that Manning's arm looked spent. "You could tell something wasn't right," one Broncos player said of practice the past month. "He just didn't look like 18 out there." 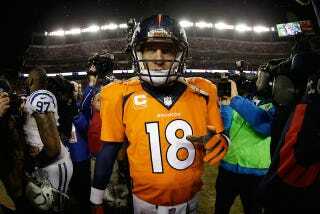 Manning was listed as "probable" with an unspecified thigh on the injury report yesterday. Schefter's report makes the injury sound bad, but a strain and a tear are technically the same thing, which means there's no way to know exactly what Peyton was dealing with unless we know the grade of the tear. However bad the injury was in the abstract, it clearly affected him yesterday. Which may be the point here. Every player is dealing with strains and tears and pulls of various levels of severity by January, and no matter how bad they are, they're a little harder to shrug off when you're inching toward 40. Update: According to The Denver Post, team sources are disputing Schefter's report that Manning's quad was "torn," claiming that it was merely strained.